Have you ever wondered just how much time you can spend outdoors in subzero temps in the depths of winter? How about in a hotel made of ice and snow? Take a good look at the image above. Notice that the bed is made of ice? And those are snow carvings on snow walls? And that’s a fur blanket for a touch of warmth? That would be real fur and faux warmth, natch. I’m talking northern hemisphere here. Quebec, Canada, specifically. 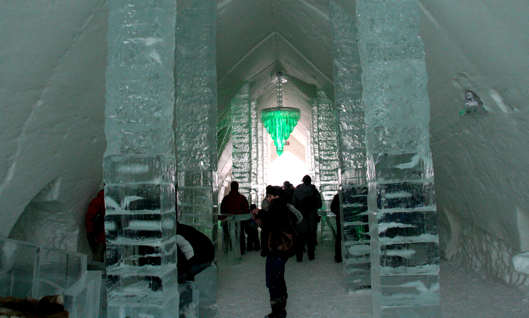 So believe me when I say that Quebec City’s 32,000-square-foot Hôtel de Glace is c-c-c-cold. 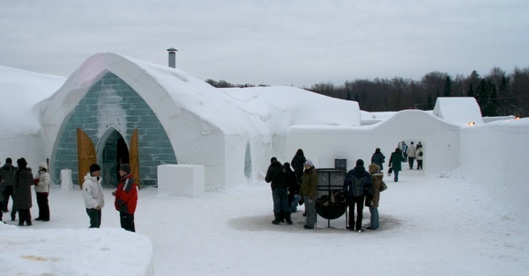 Heck, to say that winter in Quebec is ridiculously freezing would not be exaggerating in the slightest, so needless to say that the Hôtel de Glace (Ice Hotel) is really more of a novelty hotel for adventure seekers. Who wants to pay to trade down a warm, cosy bed at the Four Points by Sheraton Québec Resort, which is included in the night rate, for a slab of ice? 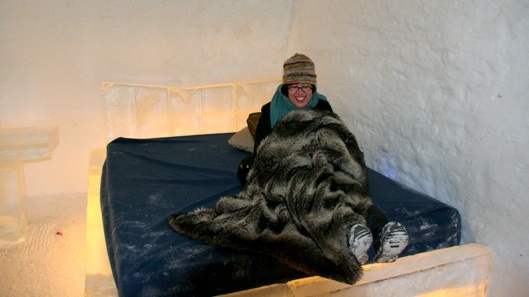 I’ll be totally upfront right now: I didn’t sleep in the Ice Hotel. For one, I can’t afford it, since accommodation starts at $400 Cdn per person! (You’ll be wanting that extra body next to you for heat, so that works out to a whopping $800 Cdn a night for a couple! Mighty expensive novelty, there.) And two, I was only in Quebec City for a day. Crazy gal that I am (this was back in 2009), I travelled overnight – both ways. I arrived at an early 6 a.m. and left at a late midnight. That made for a looong, near-frostbitten day and night outdoors, wandering Le Carnaval de Québec and the stunning Hôtel de Glace. And three, though I love gallivanting in snow (I really do), I don’t desire sleeping in it! 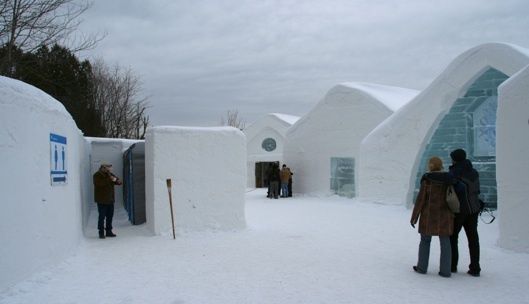 The ephemeral Hôtel de Glace, at its former location 30 mins north of Quebec City, is a marvel of snow and ice! It's a maze, too, the interior a series of rooms off long corridors – rooms you can stay in, if you're so brave as to, ahem, brave a night in this 32,000-square-foot icebox that averages -3°C inside. One of the reasons I was wary of staying at the Hôtel de Glace back in 2009 is that there appeared to be no proper toilets at the time. Nope. See the giant women/men sign on the left? It's pointing to a row of porta potties, which are a small step up from outhouses only because they usually dispense antibacterial hand cleanser. For overnight guests now, at the new location just 10 minutes from Quebec City, there's a heated bathroom, a lounge and lockers in the Celsius Pavilion near the hotel. So, yes, I freely admit I did not overnight it at the hotel. Snow is actually an excellent insulator, and the hotel interior hovers around -3°C inside, regardless of the temperature outside. My friends go winter camping in much colder temperatures, and they build quinzhees (snow shelters) to sleep in, so I know the idea of sleeping in a hotel made of ice isn’t as insane as it sounds. But two hours of exploring the hotel’s grounds and 36 intricately carved and colourfully lit rooms was more than enough time for me to lose feeling in my oh so precious fingers and toes. (The shuttle bus to and from downtown Quebec City, which took around 30 minutes, was just enough time to warm me back up!) I like to think of the hotel as a glammed-up snow fort with some strategically placed, girly ice accents: all of the rooms are made of packed machine-made snow, and the sparse selection of furniture – beds in the suites and a few benches and tables in common areas like the entry and bar – is made from huge blocks of ice. It’s a cool tourist attraction, indeed! Of all the 36 rooms, the entry was my favourite. It was this arched snow tunnel with carved ice columns and a crazy-cool ice chandelier that changed colours, from green to teal to blue to yellow to pink! People tended to huddle here, sitting on the ice benches and chilling at the ice tables. 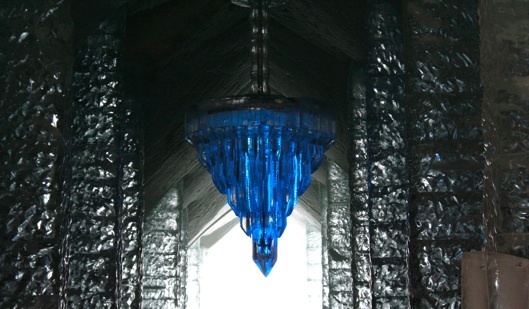 What can I say about a magical chandelier – made from faceted blocks of ice – that's illuminated a rainbow of colours from within? Spectacular! Where there's alcohol, there's warmth. 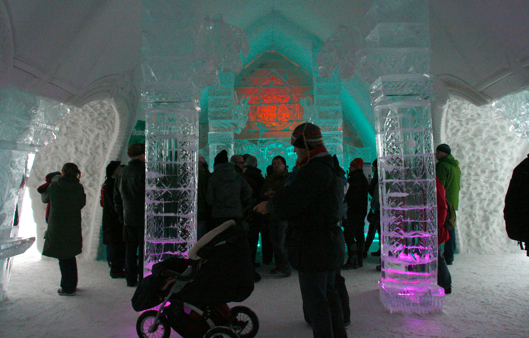 So of course, even more people were attracted to the Ice Bar! I'm not joking that everything in this space is snow and ice: drinks are served in ice glasses (read: giant ice cubes)! 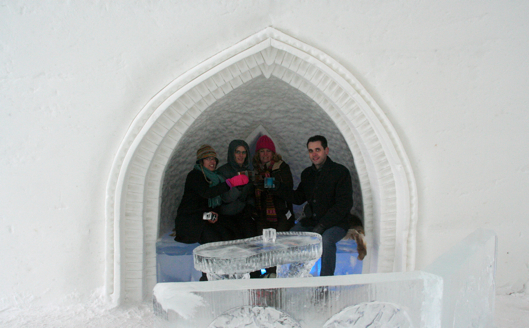 We snatched this nook as soon as we could, because there weren't many seats in the Ice Bar, which can fit 400 guests. The ice bench is covered with a fur pelt, so our tushes were toasty. OK, not toasty, but definitely not frozen! Despite being surrounded by snow and ice, we were quite cosy while sipping our cocktails served in ice glasses. Each themed suite has stunning carvings on the walls (the hockey and jazz suites were especially awe inspiring). The private rooms are open to the public till 8 p.m., after which they’re reserved for overnight guests. Though they do remain open in a way – the suites don’t have doors! They’re not directly open to one another, as the openings are staggered, but certainly it’s possible for guests to poke their heads into other rooms. So no hanky panky! And although it’s true that the beds are made of blocks of ice, there are a good few inches of blankets and mattress and wood between you and the ice. Plus, sleeping bags rated as low as -30°C are provided. If you don’t overdress and don’t bury your mouth in your sleeping bag, you’ll be fine. You’re trying to reduce humidity, as it’s the damp, not the temp, that will make you chilled – so your goal is to not sweat! Sleeping in just a layer of thermals is A-OK. The trick is to do a few jumping jacks to raise your body temperature before you crawl into your bag, so your body heat will warm the air around you. I swear by it when I camp! 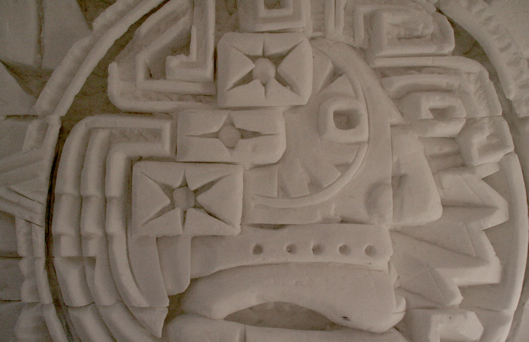 The suites are themed and showcase intricate carvings on the snow walls. This one is of a Native Canadian in a feather headdress. 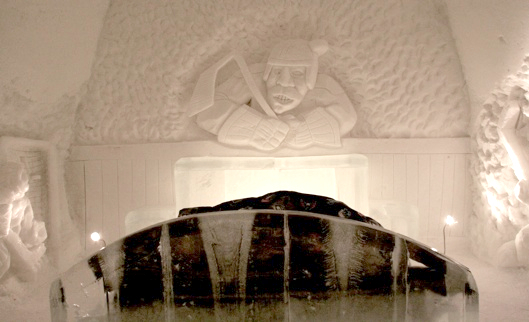 The Hôtel de Glace is in Canada, so naturally there's a hockey-themed room! This suite was my favourite, with fun scenes of excited players gracing the walls. Carvings and textured surfaces made the space seem cosy – as cosy as a room made of snow and outfitted with an ice bed can be! Cost: Day trippers are rewarded with inexpensive rates: for 2012, $17.50 (adults), $15.50 (seniors/students), $8.50 (kids), $43.75 (family). Overnight rates are per person: $400 (Northern Discovery), $450 (Adventure), $500 (Romantic Getaway), $550 (Ultimate). Wedding packages start at $2,299. 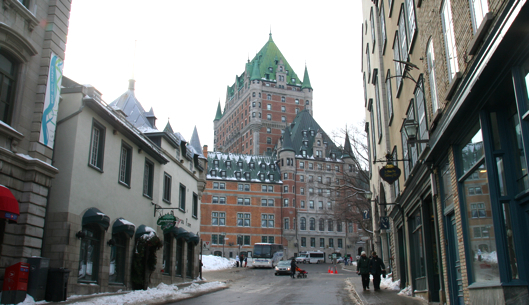 How: A shuttle bus runs to and from Old Quebec a few times a day. For 2012, transportation and hotel day admission combined is $34.95 (adults), $21.95 (kids); round-trip transportation alone is $19.95 (adults), $9.95 (kids); tickets can be purchased day-of at the tourist office. Why: Must you ask? It’s a hotel made entirely of ice and snow! Go back and reread all of the above, from the very first pic. 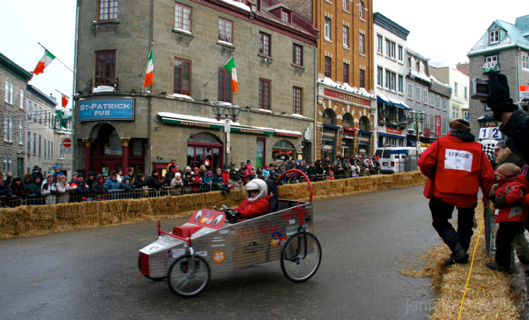 Bonus: Quebec City’s Carnaval de Québec (Quebec Winter Carnival), a 17-day winter carnival, takes place from the end of January to mid-February. It’s a treat to combine Carnaval with the Hôtel de Glace. Brrr. 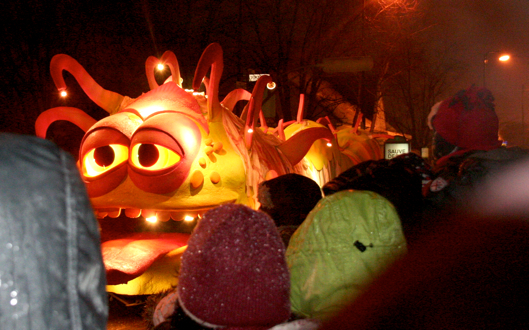 This Canuck hates to admit it, but she never knew cold till she spent a full day gallivanting outside in Quebec City, culminating in the Carnaval de Québec‘s spectacular night parade. Not that I’m a stranger to outdoor winter activities – I’m a nordic skier, after all. But when I attended Quebec’s Carnaval de Québec (Quebec Winter Carnival) a couple of years ago, I majorly underestimated just how “cold” the cold in Quebec City is! I’d checked the weather for Quebec the day before, and it was comparable to Toronto – but I swear, it felt a good -20°C colder in Quebec! With all my layers of wool and thermals and fleece and Sorel boots, I still lost feeling in my toes and fingers after mere minutes outside exploring the action on the Plains of Abraham near Vieux-Quebec (the Old Town). Weirdly enough, I was relatively toasty packed tight with onlookers watching the night parade a short bus ride away. Maybe I was warmed by the excitement generated by the spectators, from families with wee ones to groups of adults. Or maybe I was so dazzled by the marching bands, clowns and the fun, illuminated floats to notice my extremities going numb. And who could blame me? Take a peek below of my favourite floats! This, obviously, isn't part of the parade! 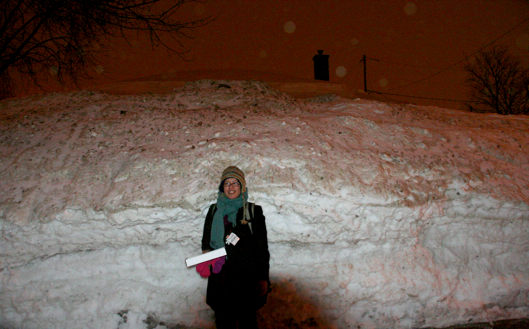 It's a pic of me in front of the World's Largest Snowbank – on someone's lawn, no less. Can you spot the top of the chimney hidden behind the snowbank? 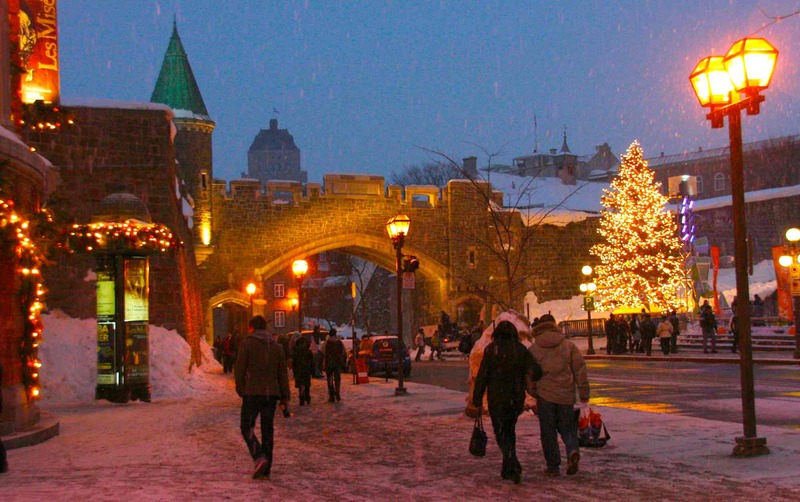 It's no joke that Quebec City gets loads of snow and is frickin' freezing. As I said, I was actually pretty warm during the parade because we were packed tight trying to get a clear view of the floats, but, dang, look at that ginormous snowbank. That's normal in Quebec! I so wanted to slide down it, as the kids were doing. 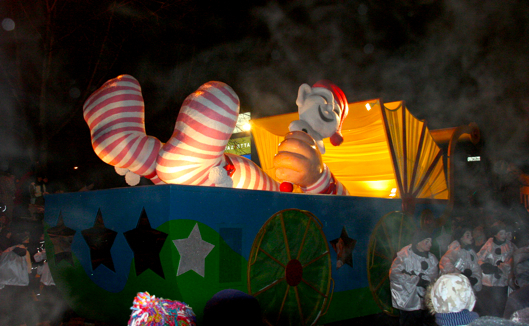 To me, the night parades – yes, there are two! 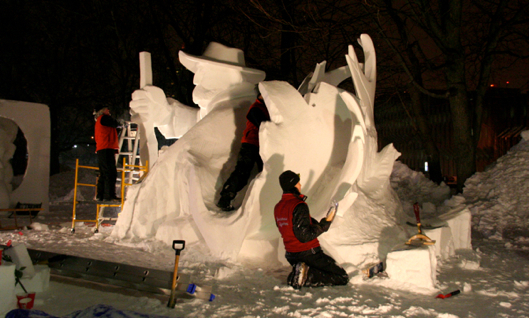 – are always the highlight of Quebec City’s winter carnival (or carnaval, en français), which dates to 1894. Carnaval takes place annually from the end of January to mid-February as a celebration leading into Lent. 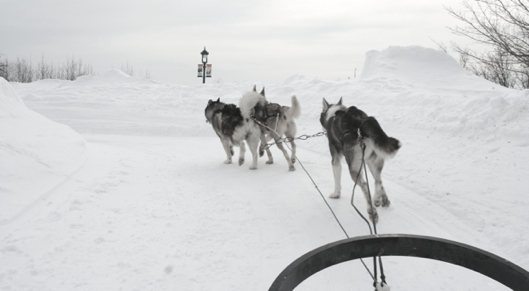 It occurs over three weekends, with some activities – like snow and ice slides, dogsled rides, snow rafting and giant table soccer games – also happening during the weekdays in between, for a total of 17 days of festivities ending on the Sunday before Mardi Gras. (Here’s a little tidbit for you: Until 1972, the dates were set according to the Gregorian calendar, and the carnival ended on Mardi Gras). The world-famous night parades take over the second and third Saturday of Carnaval, and they’re totally worth checking out. But remember, dress warm! And you can never have enough hand and toe warmers. Never. Enough. Trust me. Where: Quebec City, Quebec, Canada. 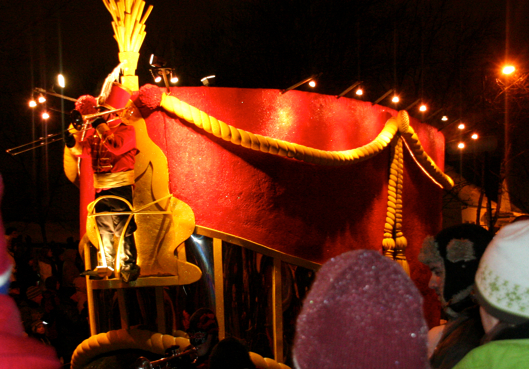 The first night parade occurs in the Lower Town (Charlesbourg), on the second Saturday; the second parade takes place in the Upper Town on the third Saturday. Parade routes will be available online starting January 2013. 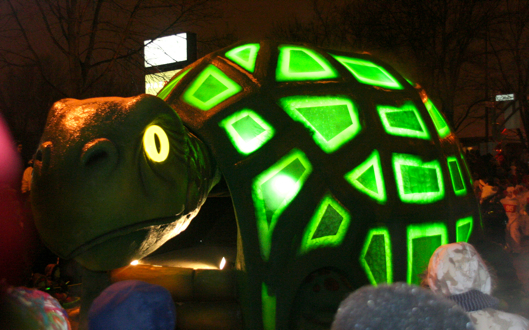 When: The 59th edition of Carnaval runs February 1-17, 2013. Yes, I know that’s a year away, but it pays to be aware and prepared! 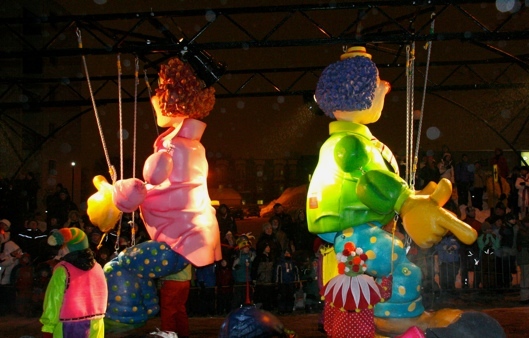 The night parades will take place on February 9 and 16 at 7 p.m. Cost: The parades are FREE! However, if you want to participate in other Carnaval festivities, you’ll have to purchase a Bonhomme Effigy (a figurine of Bonhomme, the carnival’s snowman mascot). In 2012, the Effigy cost $12. 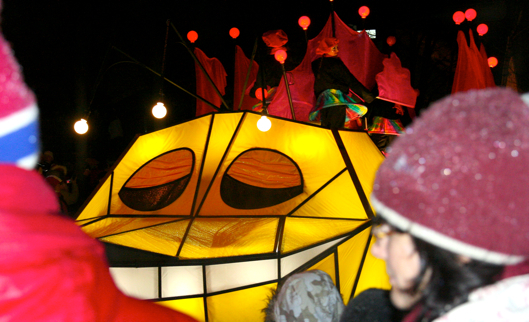 Why: The night parades are colourful and energetic – for both kids and adults! DAY 5 Another lazy day! Except, I never do lazy very well. As I’ve said before, I’m not the kinda gal that jets off to a tropical destination just to lounge on a beach. 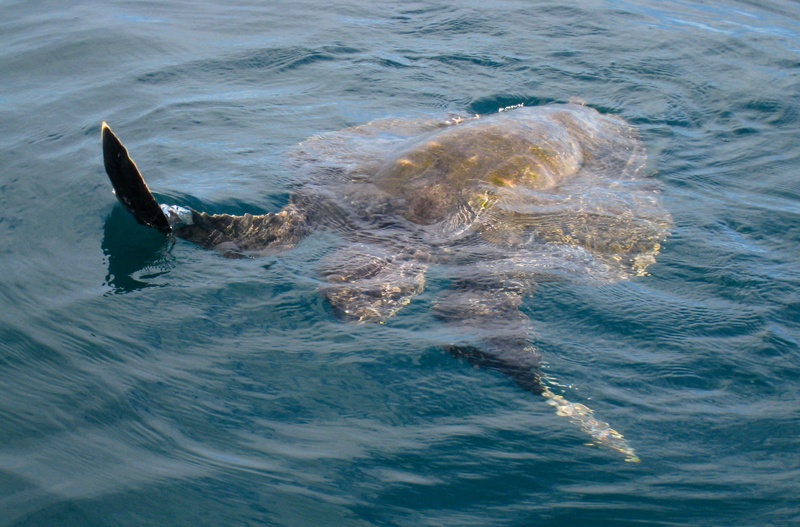 That’s why Costa Rica is an ideal getaway for me – there are more than enough activities to balance out the laziness. 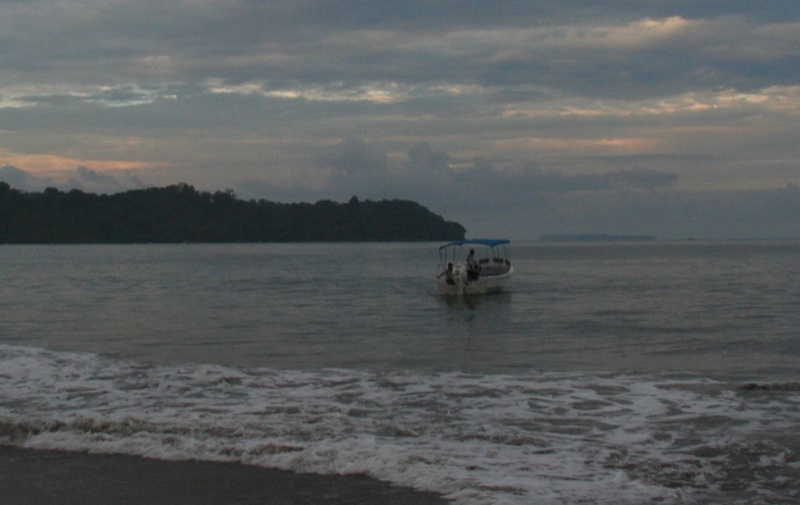 But after shelling out the big bucks in Drake Bay to snorkel with sharks near Isla del Caño and mingle with monkeys in the rainforests of Corcovado National Park, I’d decided to cool my heels by spending a few days chilling at my eco-lodge, Pirate Cove. Or so I thought. Honestly, there’s really only so much beach I can take. So for my second lazy day at Pirate Cove, I threw in a couple of hours of horseback riding in between my beach time and paddle time. 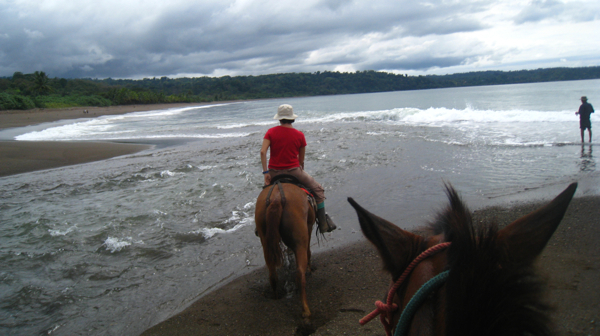 And unlike the horseback riding I did later on in Santa Elena, riding at Pirate Cove felt like an authentic Tico experience. There was something very relaxed and easy about it all. Susanne, one of the owners, manages the lodge and loves horseback riding; she was really excited to ride that day because the only chance she gets to ride is when a guest rides too. 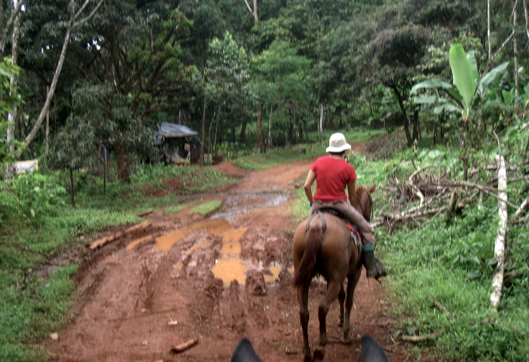 That day, I was the sole guest who’d requested it, so it was going to just be me and Susanne riding through the jungle! 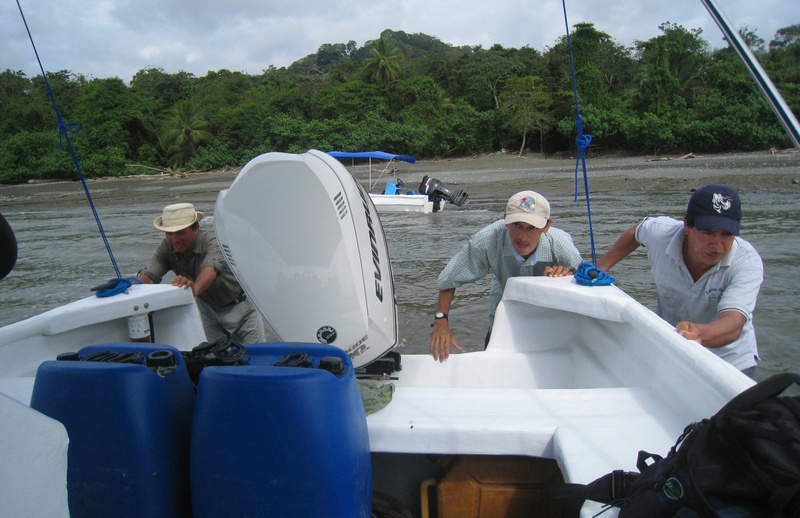 It’s personal experiences like riding with a private guide that made my stay at Pirate Cove so special. As usual, I waited till low tide before crossing the river. 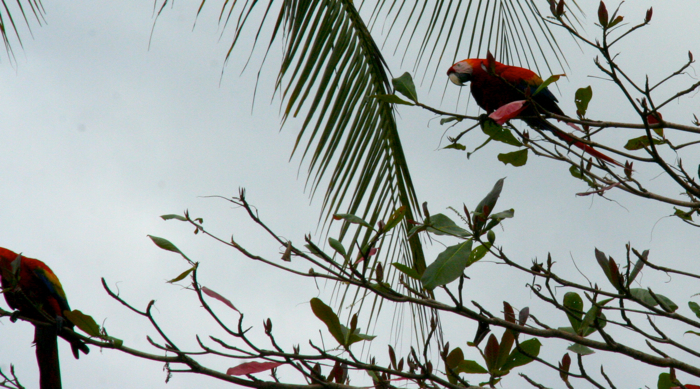 I strolled along the beach a bit before lounging under an almond tree, where I'd seen a pair of scarlet macaws the day before (macaws love almonds, so it's not unusual to find them in almond trees!). This stretch of beach became my go-to spot for lounging. Yes, I do lounge, though not very often and not for very long! And, hey, if lying on a deserted beach was what it took to get a shot of those elusive scarlet macaws munching almonds, well, I wasn't about to complain. Except that all of a sudden, Susanne came galloping up on horseback. 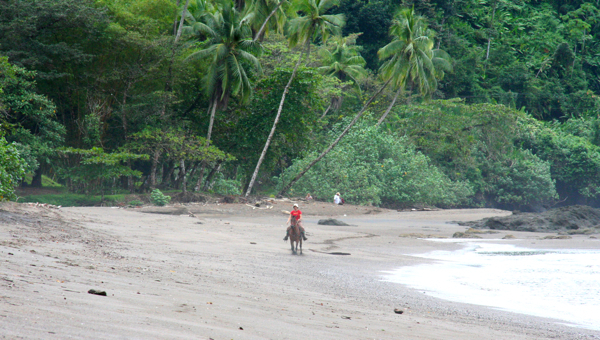 I didn’t realize it was her till she was close – hardly anyone walks, let alone rides, along that two kilometre beach. I thought we were riding at 1 p.m., which is why I’d spent the morning relaxing at the beach; she thought we were riding at 11 a.m. and was wondering why I wasn’t at the lodge. Oops! Thankfully, they’re pretty laid back at Pirate Cove, and when Susanne found me lying there, she told me to continue chilling and we’d ride after lunch. Phew! 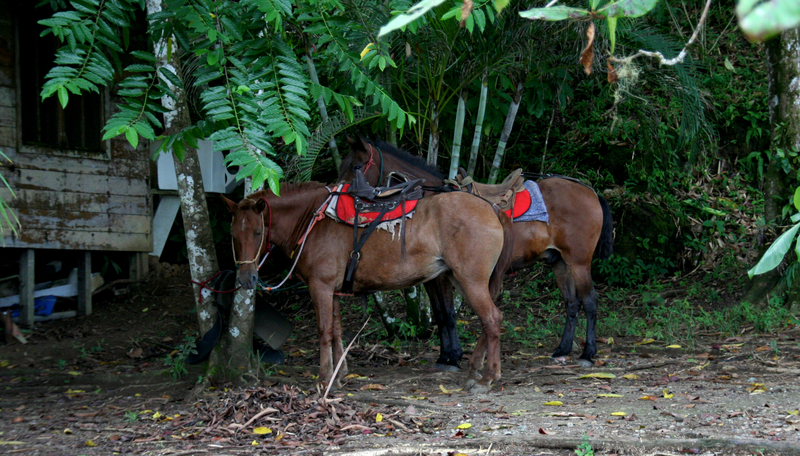 When I returned to the lodge, I found our horses waiting next to the trees down by the beach. I was a smidge scared to get on my horse, Coyote (he’s the one in the back), for fear his saddle was going to shift right around as I swung my leg up and over. As I was taking such a long time trying to mount Coyote, Susanne had me use the bench beside this hammock as a step. And I know it’s silly, but I had to use it to dismount Coyote, too. I chalk it up to my fear of heights! From the lodge, we rode along the main (gravel) road, and on the way to the tiny town of Drake, I noticed a series of monkey bridges in the treetops so the monkeys could cross the road! 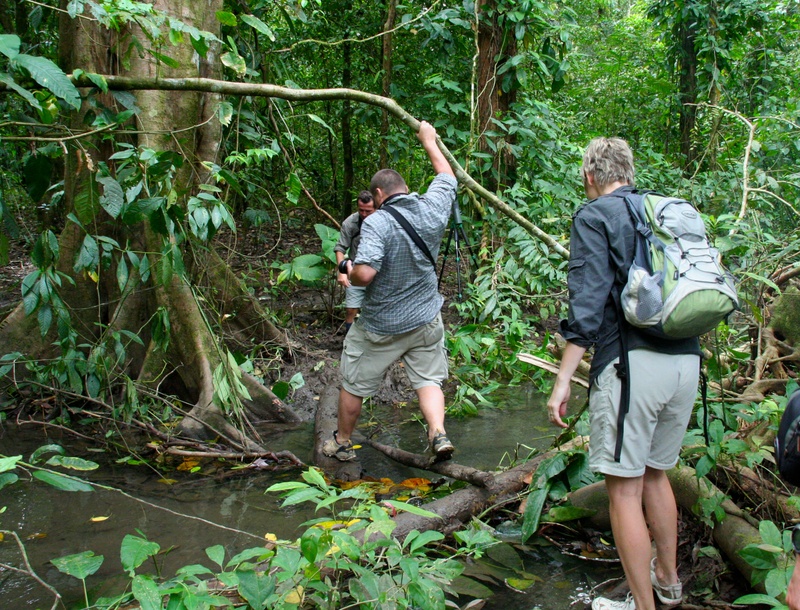 It really is a jungle out there, just beyond the lodge! And it’s really rugged out there too, as I’ve said before. Those monkey bridges are some of the only bridges in the area. 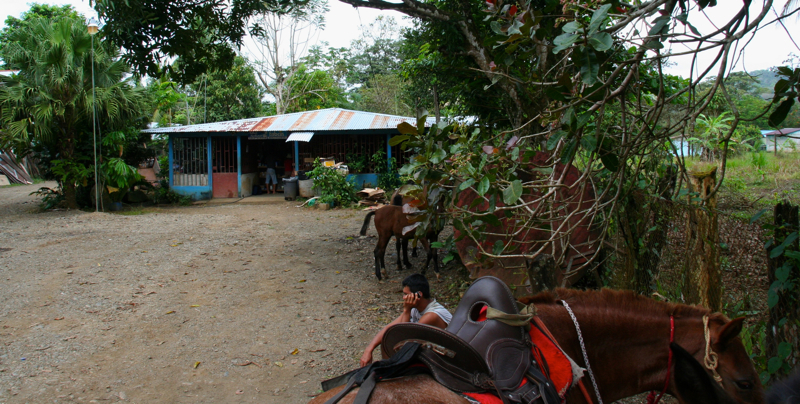 When we reached the Rio Drake, our horses continued right on through it without a pause! I’d crossed the river by car the same way the day I arrived – and, lemme tell you, I thought our car was going to get stuck. No worries about our horses getting stuck, though I did fear I’d fall off Coyote, thus I gripped the reins mighty tight. Riding was fun! I enjoyed passing by the locals’ houses and looking out across the fields and forests to the mountains in the distance. It took us about half an hour to ride to the town, where we stopped at the soda for a drink. I was still too scared to get off and on Coyote, so I stayed on him and snacked like that while Susanne was laughing at me (I would have laughed at me too!). After our break, we turned down the little road past the school (which has a big football field) and continued through a muddy path in the jungle, passing the occasional house and harvested field. Every now and then, especially as we got closer to the beach, Coyote would break into a gallop and I’d freak out even more till I could rein him in. But it was rather thrilling when the jungle opened up to the beach, and we could see the vast stretch of sand and sea before us. A bit farther down the beach was this shipwreck washed ashore! It’s split in half, and locals were salvaging it for parts to sell/reuse. From Pirate Cove, it was a small speck in the distance. I’d no clue that it was there! We ended up riding two kilometres back along the beach, which you can only do at low tide because at high tide stretches of the beach completely disappear under the water! 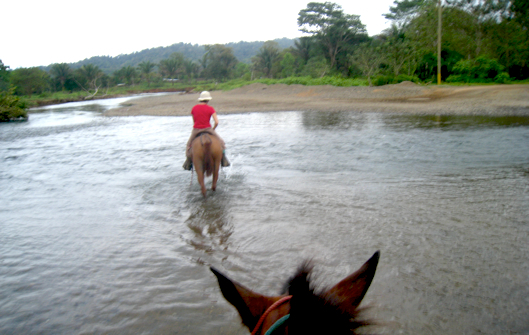 When we reached the Rio Drake, our horses plowed right on through again, the rushing water coming up to their bellies. DAY 4 P.M. Ta-da! My lazy “do nothing” day at Pirate Cove was relaxing but still so packed with animal sightings that I had to break it up into two posts. Double the pleasure, n’est pas? (I wish I could say that en español.) Gosh, to say I dislike creepy crawlies is an understatement. 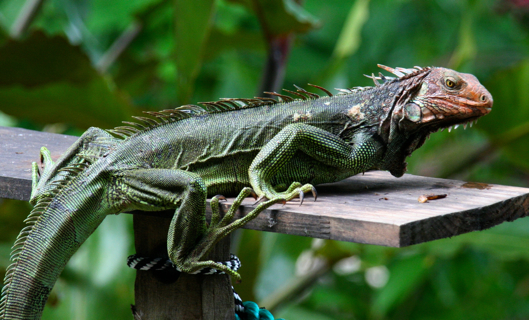 It’s beyond me why I later did a night tour, when I did not enjoy my daytime encounters with lizards like this one. It’s a clear enough photo that I could zoom in closer, but why would I want a detailed look at this beast? I got creeped out looking at it from a distance! Yes, my lazy day at Pirate Cove started out with my having breakfast with a toucan, so it shouldn’t have surprised me that a lizard would join me for lunch! Annnd that a caiman would tease me before dinner. No joke!!! In case you forgot (tsk tsk), this is the gorgeousness I awoke to! 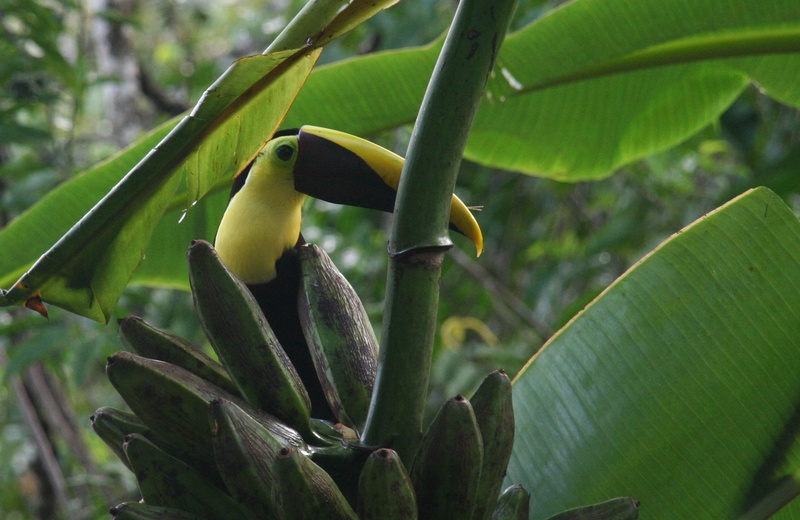 You can read about this toucan and my morning adventures here. C'mon, you know you want to know more! DAY 4 A.M. Ahhh, a laaazy day. I love lazy days. I’m not a lounging-on-the-beach-sipping-cocktails kinda girl, but nothin’ wrong with chilling. 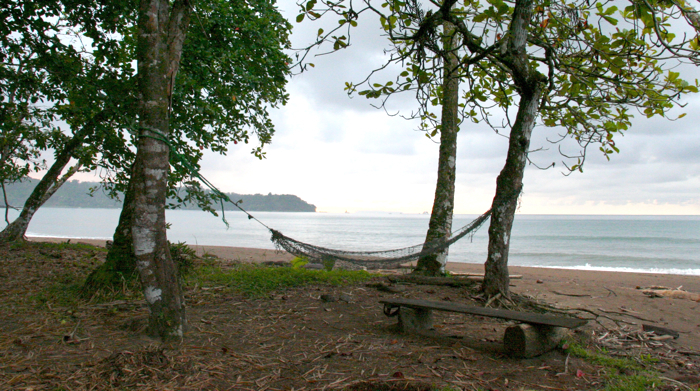 After the excitement of Corcovado and snorkelling, I was perfectly happy relaxing in my hammock, swimming in the ocean, walking along the beach, chasing after lizards and kayaking down the river by Pirate Cove. Lest I forget my little late-afternoon run-in with the caiman. And, hey, my day was still guided by those crazy farmer’s hours and the tides! While the other guests were frolicking out by Isla del Caño, I was savouring delicious fresh pineapple during a looong breakfast, waiting for low tide so I could cross the Rio Drake to explore the beach on the other side. That’s when the real awesomeness of Pirate Cove became apparent: how close to nature you can get! 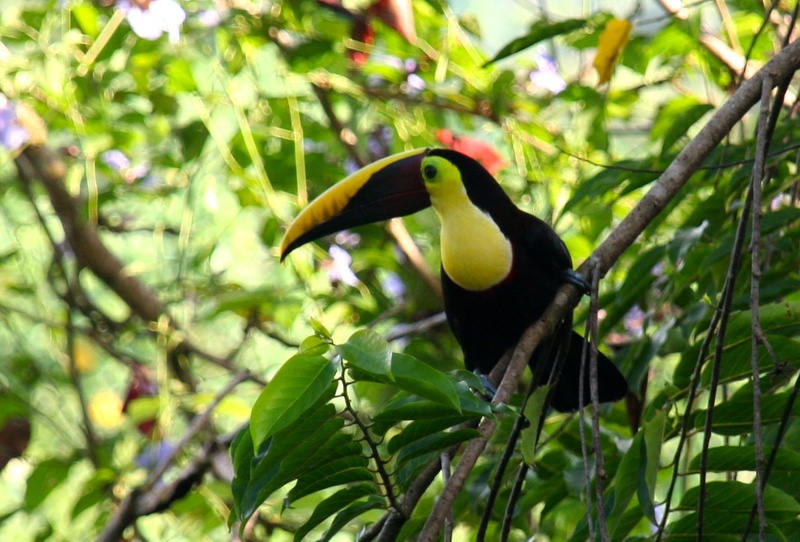 Early morning toucan sightings were the norm on my lazy days. How cool is that? 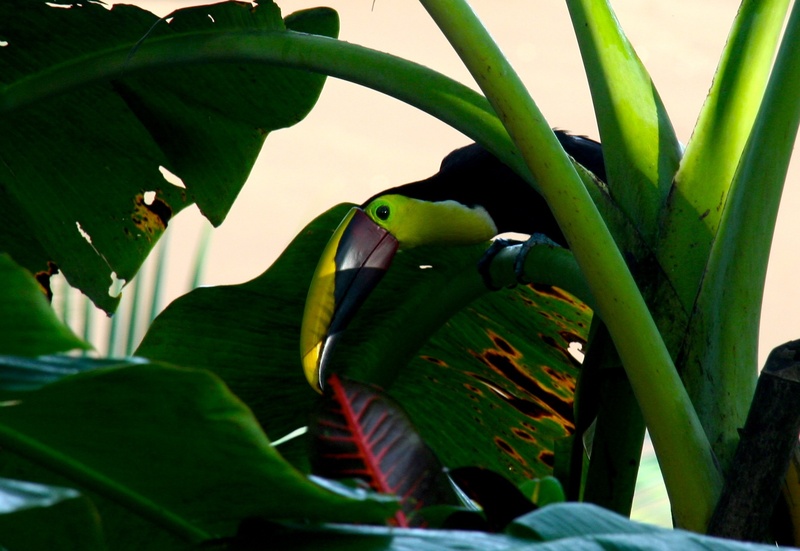 I’d be relaxing over breakfast, and this chestnut-mandibled toucan would scavenge for berries in the trees beside me. Every. Day. Snow! Yes, we’ve finally got snow. OK, I’m kinda cheating with this shot. 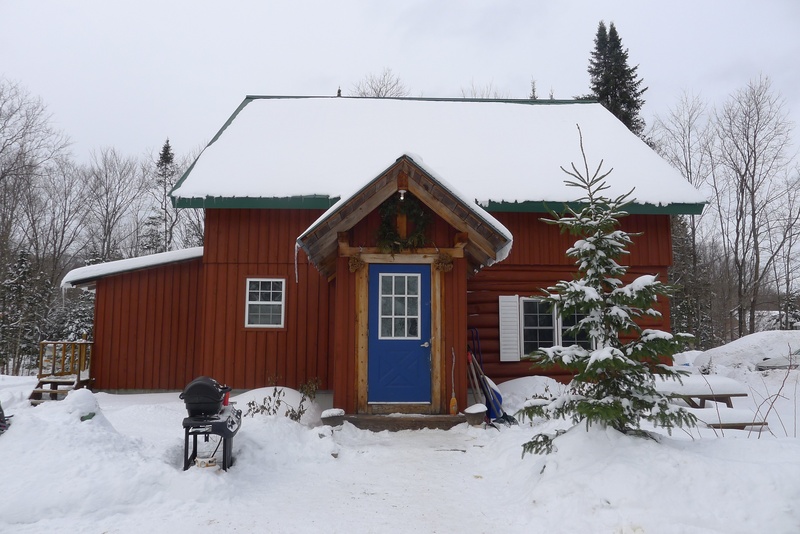 This pic’s of the cosy lodge at Wolf Den Bunkhouse n’ Cabins, a youth hostel mere minutes from the glorious Algonquin Provincial Park, up in cottage and camping country. I visit Wolf Den every January with some friends from the Toronto Outdoor Club because it’s truly a winter wonderland. So, no, Toronto does not look like this. Though we did get some fluffy white stuff the other night, it’s currently 7°C in Toronto, everything’s melted, and our crazy non-winter continues to confuse us all. If only I weren’t injured, I’d be B-icicling through this wet mess…in February. But instead of B-icicling, I went up to Wolf Den and got my snow fun on. 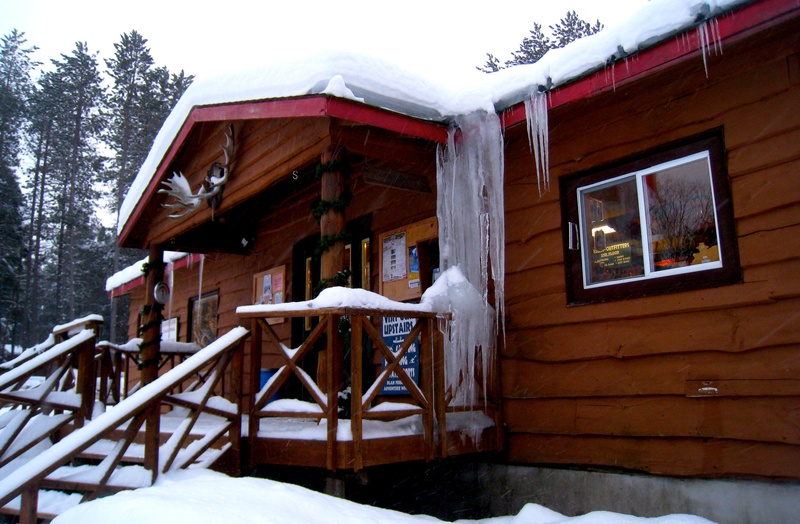 The Toronto Outdoor Club’s annual winter trip to Wolf Den is an in-demand event. That’s because Wolf Den has such a relaxed vibe, with an open-concept communal self-catering kitchen/dining area on the lodge’s main floor (it’s a hostel, afterall, complete with picnic tables inside! ); a cosy loft lounge upstairs, with a fireplace, plenty of sofas, cushions and books to curl up with (and musical instruments, like a digeridoo and guitar, if you’re so inclined); and a handful of small, private rooms downstairs (linens included). Some people prefer bunking in the cabins, which house more beds per room (there are no bunkbeds at Wolf Den) and have that lovely woodsy scent. The downside of the cabins in winter is that you’ll have to make the middle-of-the-night trek through the snow to get to the washrooms in the lodge, as the outdoor toilets are closed for the season. 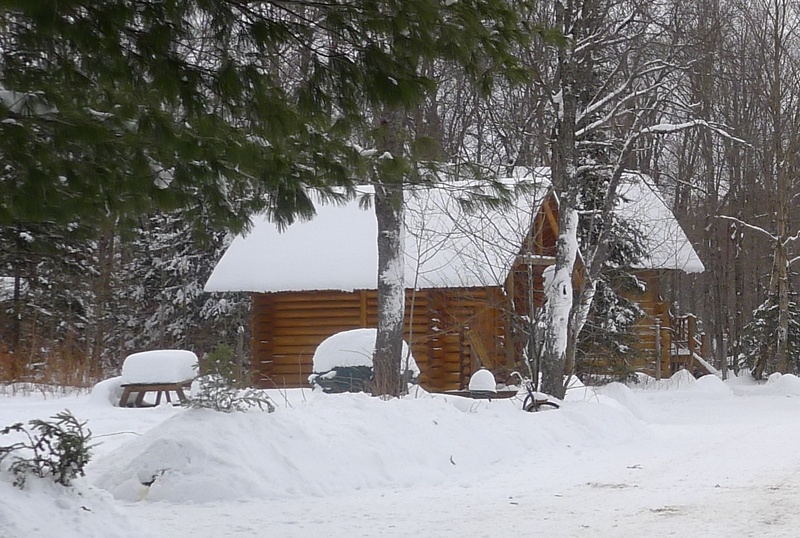 I like sleeping in the lodge, but I know those who swear the cabins are worth the frigid walk. As lovely as the lodge is, the main reason I love Wolf Den so, is that it’s sooo close to Algonquin: it’s only 5 minutes to the west gate. The short distance to the park means that snowshoe and cross-country day trips are always on the agenda. 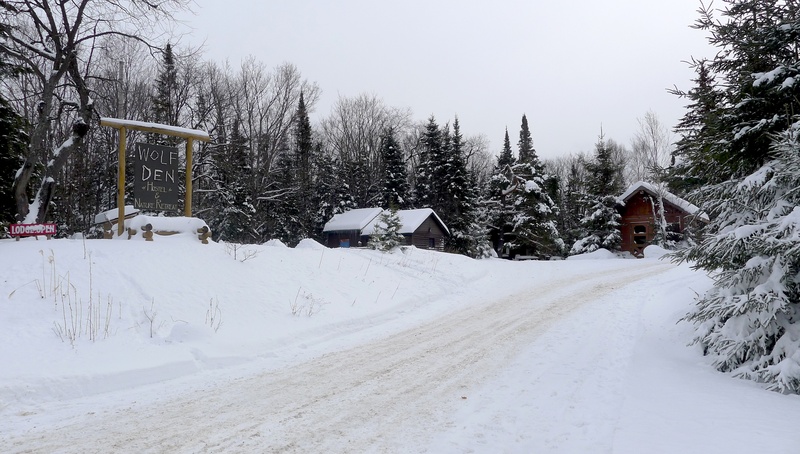 If I’d been allowed to ski this trip, I’d have done the trails at the picturesque Fen Lake, which has four loops ranging from 1 km to 13 km, and a tiny warming hut, ideal for a lunch break by the wood stove. Since I couldn’t ski this trip, the best part of Wolf Den was mighty appreciated: it’s walking distance from three great hiking/snowshoe trails! 1 Ragged Falls About a 10-minute walk east, Ragged Falls has a short 1 km official trail out to the falls, which are gorgeously frozen in winter; the trail unofficially continues a bit farther, though I haven’t gone that way. 2 Beetle Lake Trail About a 20-minute walk west of Wolf Den, you’ll find the 6 km hilly Beetle Lake Trail, which you can access from either side of Oxtongue Lake. It starts (or ends) on Elliot Road, just east of the lake, and finishes (or starts) on the other side, merging with the trails at Algonquin Outfitters (see below). 3 Algonquin Outfitters The series of flat cross-country ski and snowshoe trails at Algonquin Outfitters could easily keep you busy for an afternoon. Bonus: This is where you can conveniently rent skis and snowshoes for the day (or half-day). Even better: You can pay for a full day, and switch between borrowing skis and snowshoes, so you can do all the trails behind the outfitter. 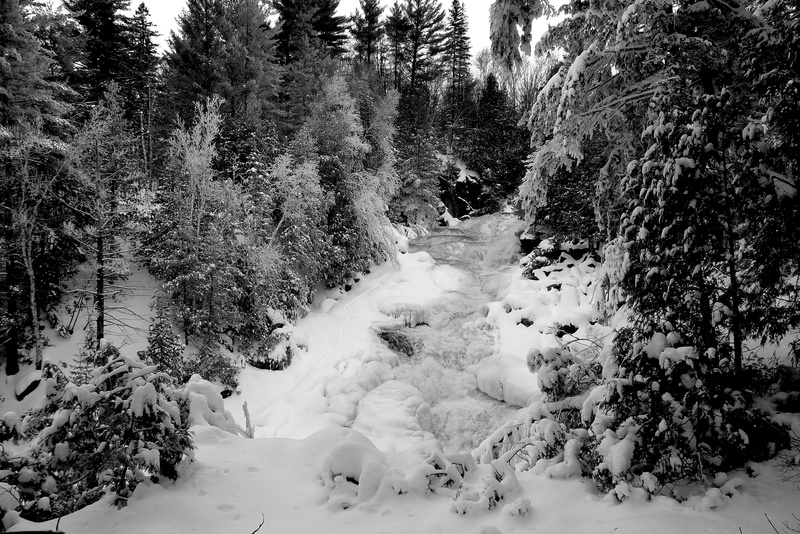 The frozen, but still rushing, Ragged Falls. Last year, we hiked out to the falls late at night, and though we could hardly see anything in the dark, we could still hear the magnificent roaring water. 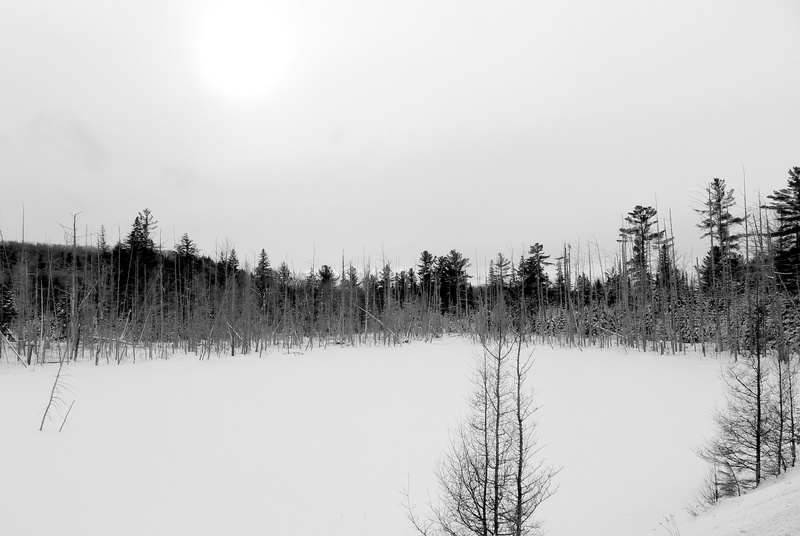 A wee frozen pond between Wolf Den and Ragged Falls. 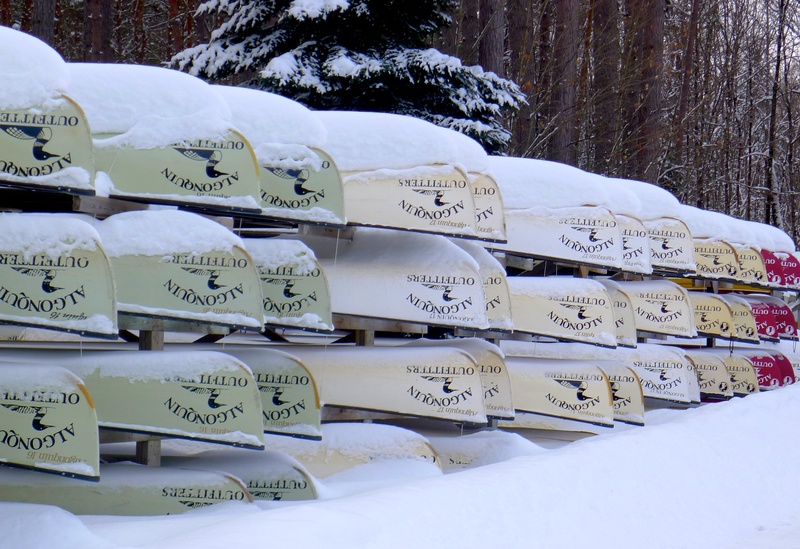 There are dozens and dozens of canoes covered in snow at Algonquin Outfitters! I love skiing the trails behind the store, because you don’t need a trail pass, and it’s walking distance from Wolf Den. It’s not as pretty as Fen Lake, but it sure is convenient when you don’t want to depend on carpool. Just try to not be tempted by the store’s sales! Last year when we went up, it was around -25°C! And we had lots more snow! And icicles, as you can see here. Annnd I was very happy to warm up inside Algonquin Outfitters after skiing the trails out back. It’s always nice to come back “home”! Wolf Den‘s owner, Ben, builds a bonfire every Saturday night, hidden in the trees between those two outbuildings. This year was warm enough that a few of us were lured out of the cosy lodge to roast marshmallows by the fire; last year, poor Ben was tending the fire solo, ’cause we were all too chicken to chill outside. The one thing I’ve noticed about being out here in winter is that the sky is crazy clear at night, so you can easily see constellations like the Big Dipper and Orion’s Belt. I even spied a shooting star this time! I’ve yet to be tempted to stay in a cabin, as I’ve zero desire to bundle up in the middle of the night to use the loo in the lodge, but I’ve friends who swear by the delicious woodsy scent. Nope, I like lounging in the lodge and having my sleeping quarters right downstairs. I would stay here every weekend if I could afford it! When: Open year-round (uh-huh), but particularly lovely in winter if you’re not up for winter camping! Why: For people who want to enjoy the Great Outdoors during the day, but enjoy coming home to a warm, cosy lodge or cabin at night. And the communal hostel atmosphere really appeals to some people. 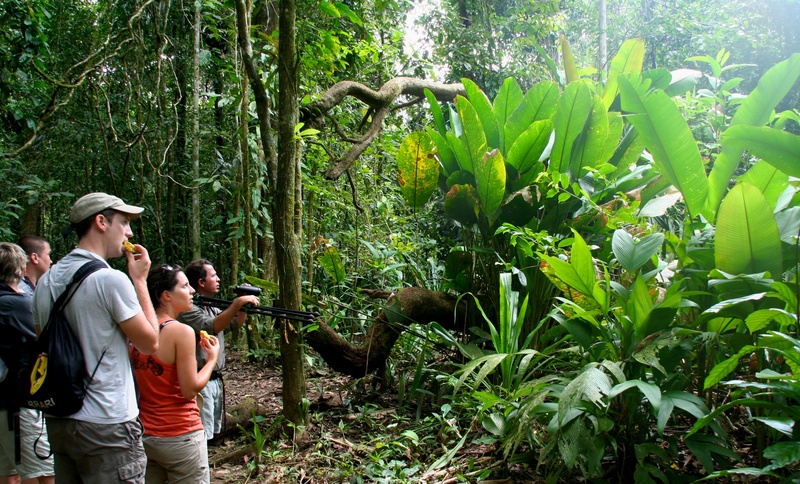 costa rica: it’s a jungle out there! DAY 3 So after a faaabulous day snorkelling near Isla del Caño (dolphins! sharks! stingrays! 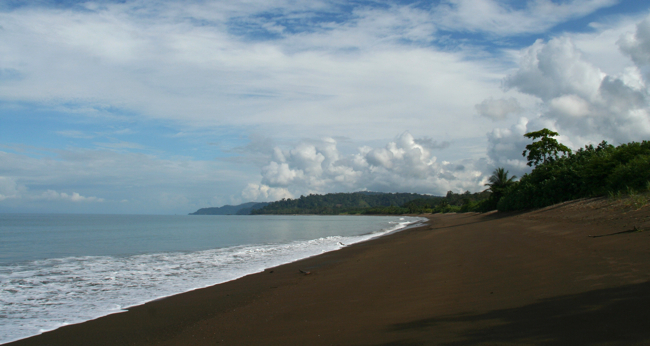 ), I woke up at an even earlier ungodly hour the next day to visit one of the largest national parks in Costa Rica: Corcovado. Everything starts early in Bahìa Drake – breakfast is at 5:30 or 6 a.m. – because you have to take a boat to go anywhere, and that might take at least an hour. So everyone gets up before 6 a.m. and then goes to bed around 8 or 9 p.m. I hadn’t quite gotten used to the farmer’s hours just yet, but it was definitely easier to wake up before dawn when I had Corcovado to look forward to! Admittedly, $90 US seemed steep for a day trip to Sirena, one of four research stations in the park. 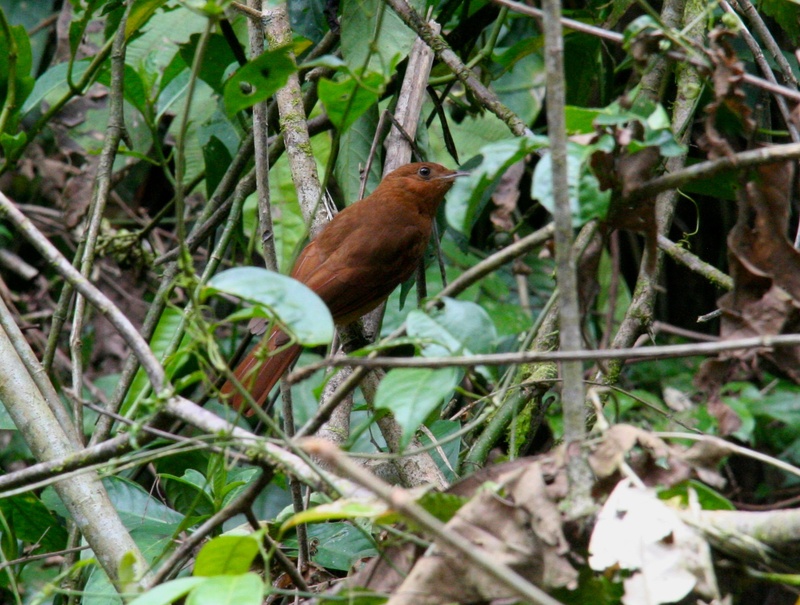 But my main reason for coming to Bahìa Drake was Corcovado (National Geographic has called it “the most biologically intense place on earth”). 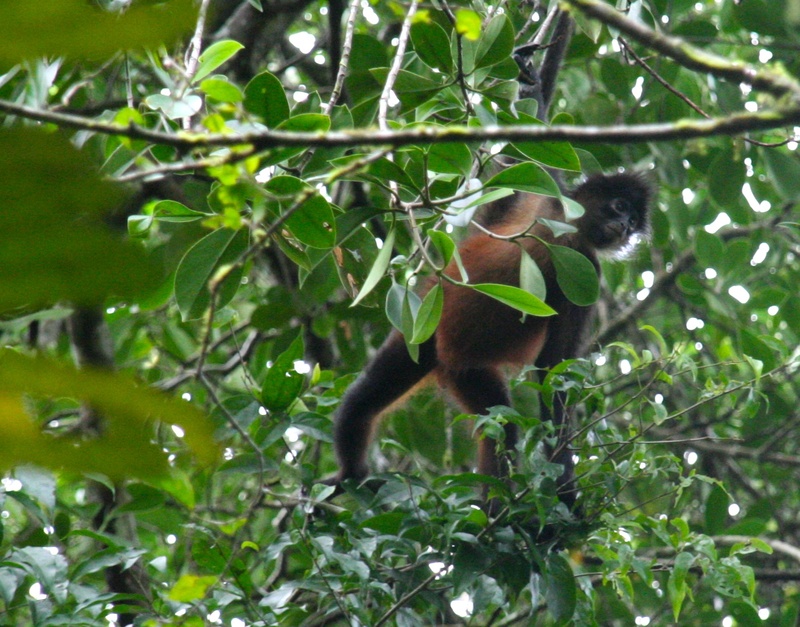 And after seeing such an amazing array of animals (howler monkeys! squirrel monkeys! 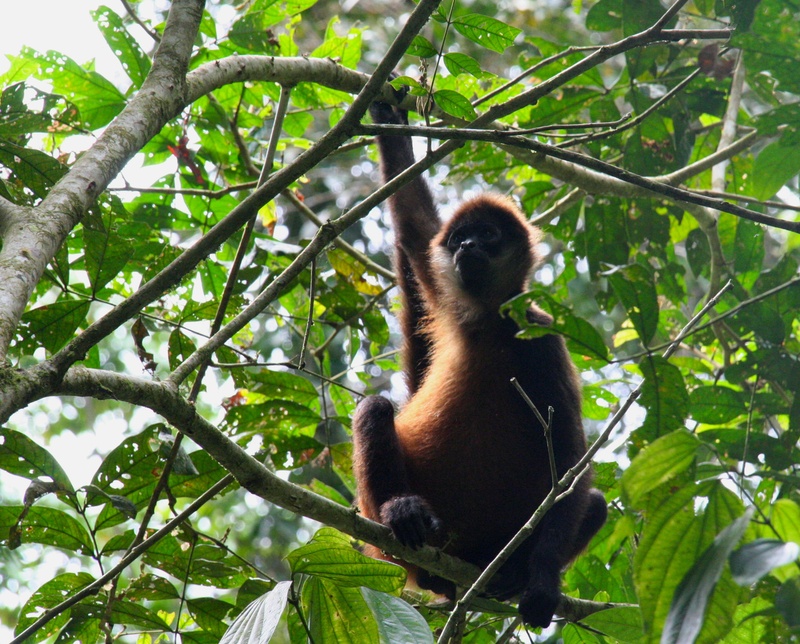 more howler monkeys! ), I vouch it was worth every penny! Corcovado was absolutely the highlight of my trip. 6:10 a.m. Yawn. It was still dark when I left! As I’ve said before, Pirate Cove was a distance from the main tourist hub of Bahìa Drake. Since I was the only tourist from Pirate Cove that day, the driver had to make a special trip to pick me up before making stops farther down the coast. Yes, I’m special. Remember that. 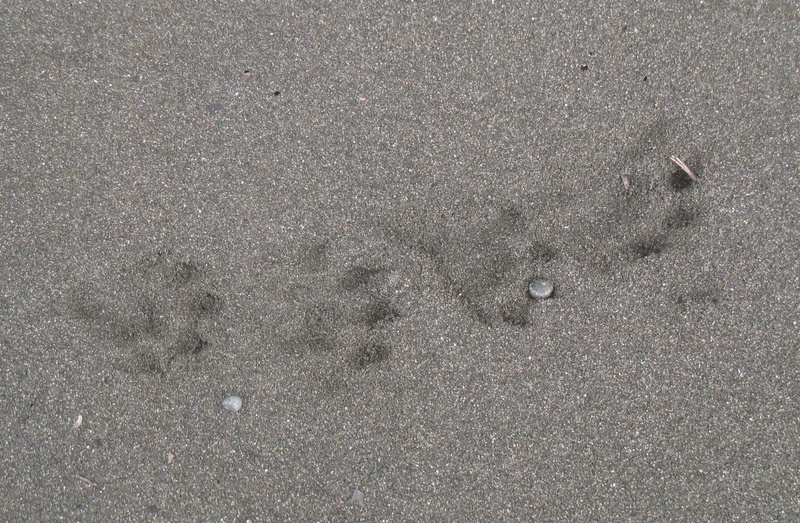 8:05 a.m. Ohhh, panther prints! Once ashore (after about an hour-and-a-half boat ride), we split into two groups. Eight of us were whisked away by Javier, our guide, who promptly pointed out the prints. Though panthers and jaguars are sometimes spotted near Sirena, I suspect Javier was pulling our naive tourist legs…but I believed him! 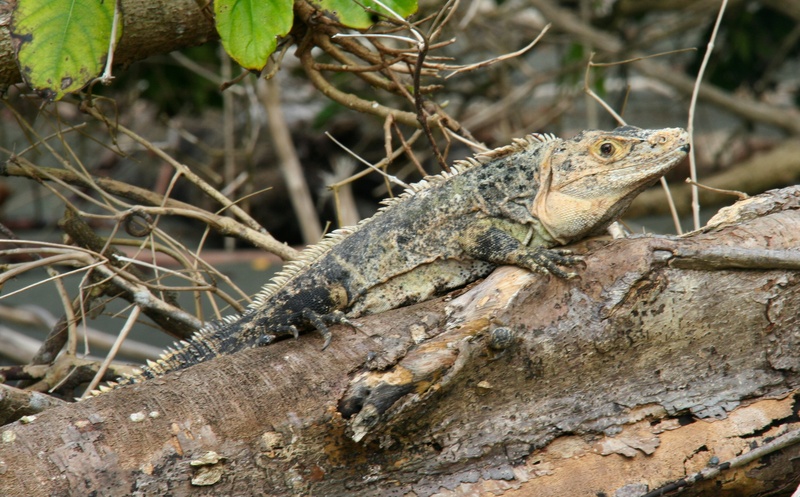 9:30 a.m. Lizard! Yup, we saw lots of ’em chilling on driftwood on the beach. 9:35 a.m. 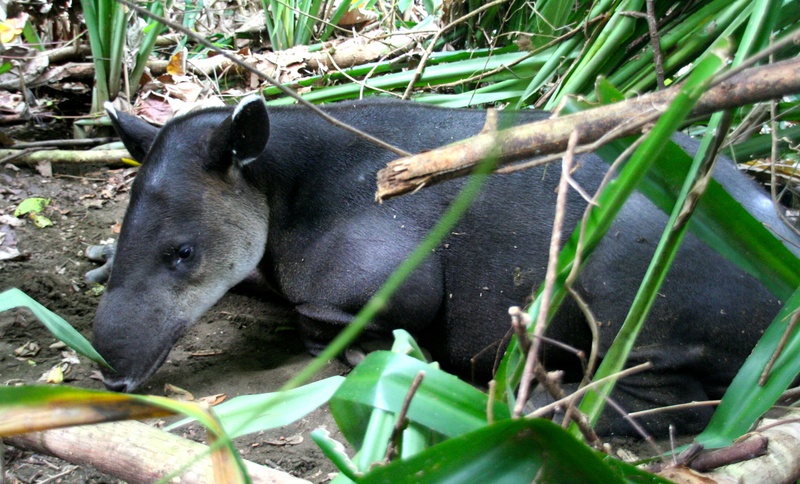 The famous – and endangered – Baird’s tapir is the largest mammal in Central America. A nocturnal animal, this particular tapir can be found cooling himself in his mud hole during the day. And who could blame him? It’s darn humid in the rain forest! There was condensation in my camera lens! 10:05 a.m. Kudos to Javier, who was carrying around a heavy Swarovski telescope. He’d let us take pictures through it with our point-and-shoot cameras. Sometimes the birds were so high up, even the fancy zoom lens on my DSLR couldn’t get this close. 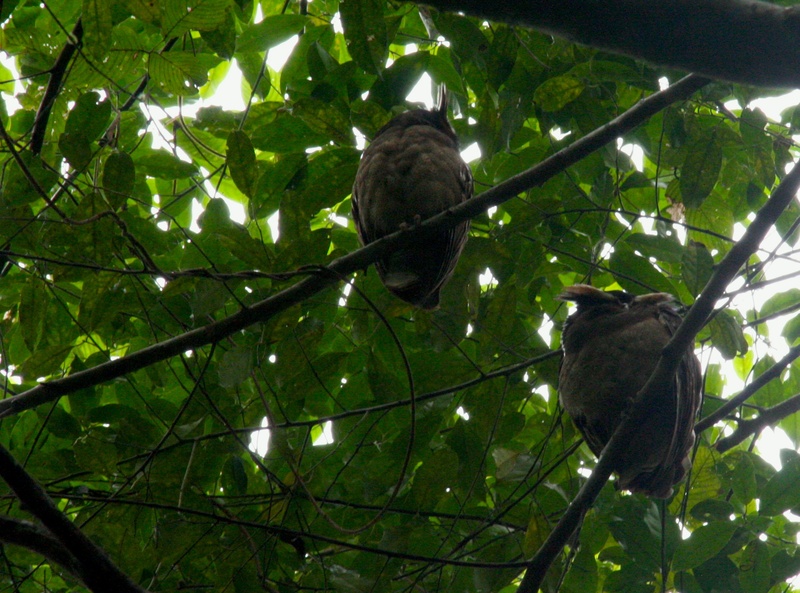 10:20 a.m. Like the tapir, this pair of great horned owls seemed to always be found at home and remained undisturbed by us. 10:35 a.m. My first monkey! Yay! 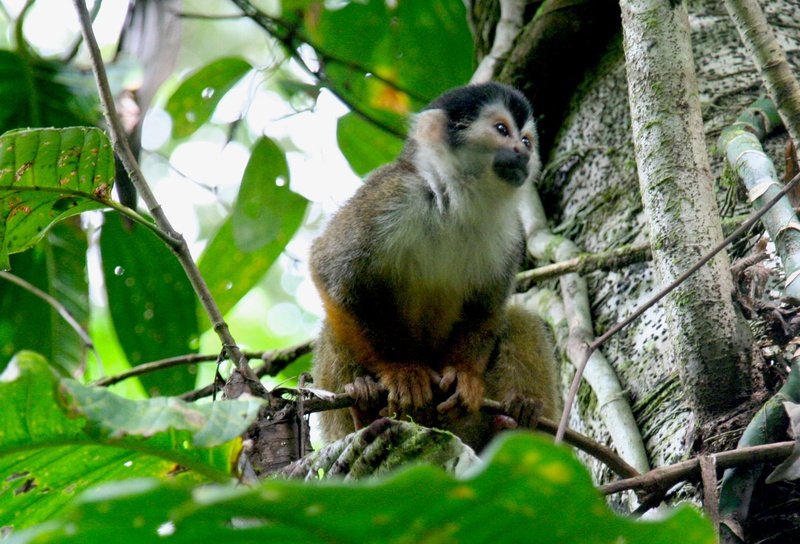 Corcovado is the only place in Costa Rica where you can find all four species of native monkeys: the squirrel monkey, white-face monkey, howler monkey and spider monkey. To tell the truth, I hadn’t researched that beforehand, and I couldn’t tell the difference between them. Looking at pictures now, I can see their features, but at the time I could barely see them at the tops of the trees (the trick is to look for moving leaves)! Five minutes ago, I was convinced the one above was a squirrel monkey, but now I’m sure it’s a baby howler (because of its black face). Actually, now I think it’s a spider monkey! 11:03 a.m. In action! 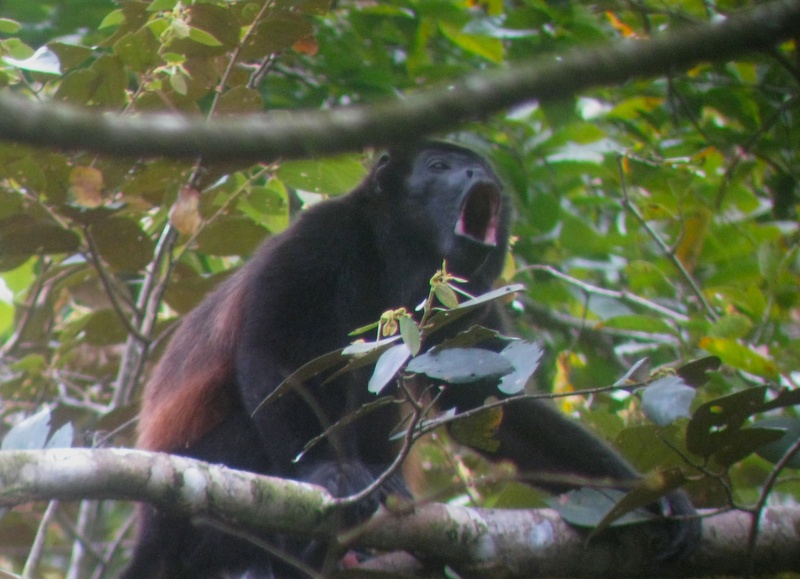 An adult howler howling! Courtesy of Javier’s telescope. 11:45 a.m. Post-lunch, which we’d eaten at the research station, we took a different trail. I’m still amazed at how huge all the plants were. Mom would be so jealous! 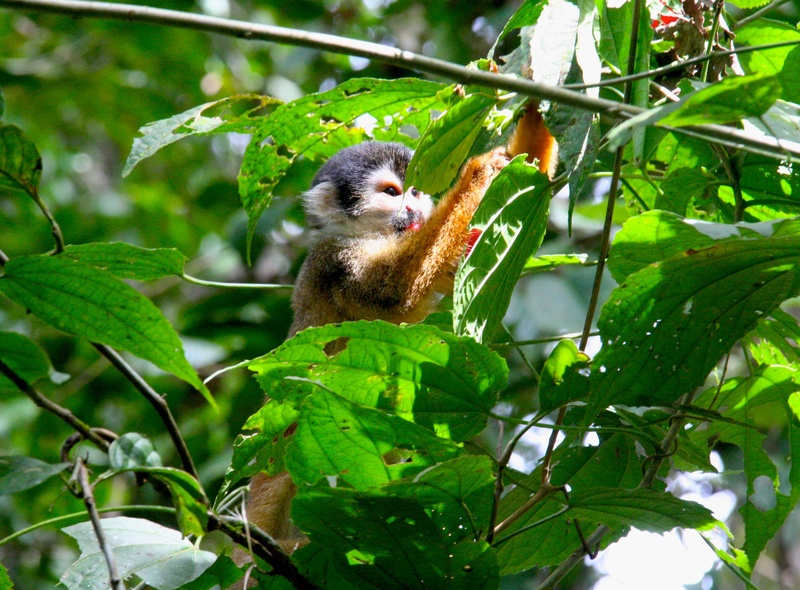 12:15 p.m. A squirrel monkey (I’m sure of it! 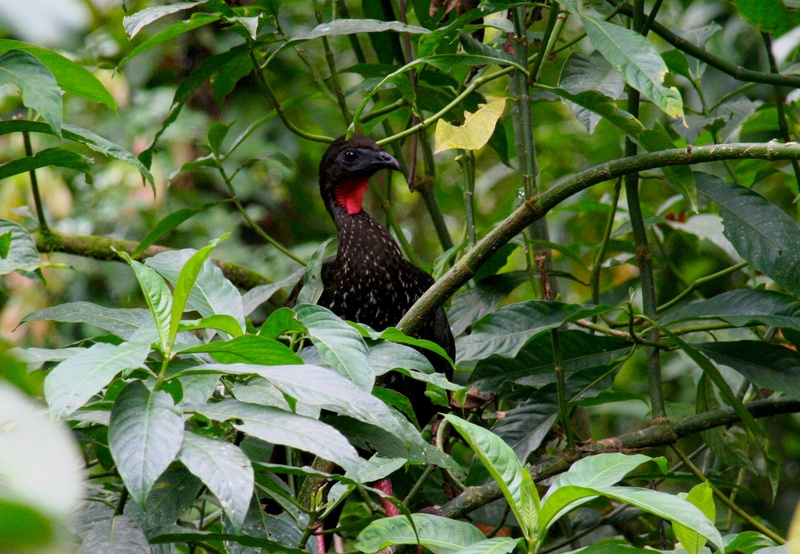 ), hidden behind some leaves. 12:30 p.m. Can you see them? I count five – five clumps of dark fur nestled in the branches. 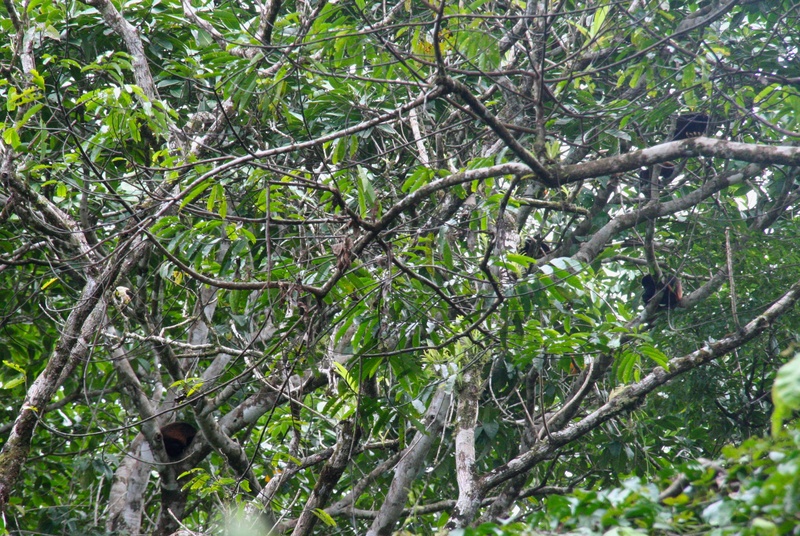 Howler monkeys. Later, as we were heading back to the beach to wait for our boat, we could hear them howling! I took a video just for the audio – they sounded like dogs howling at each other! Truly eerie. 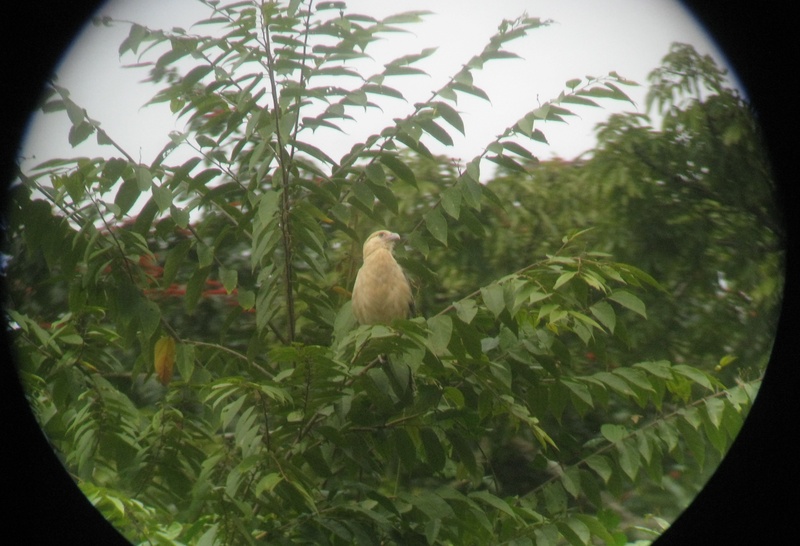 12:31 p.m. My first trip to Corcovado was really all about the monkeys, though we did spot a few birds, such as this mysterious brown one. 12:37 p.m. And this one, which I’m calling a partridge, but it’s not. 12:39 p.m. While I live to cycle, hike and paddle, I willingly admit I’m a klutz and am always injuring myself. Crossing this creek didn’t not go well for me – I slipped and spent the rest of the hike in soggy boots. 12:50 p.m. But falling in the water had its perks: Javier felt sorry for me and let me get up close to this little howler squirrel monkey. 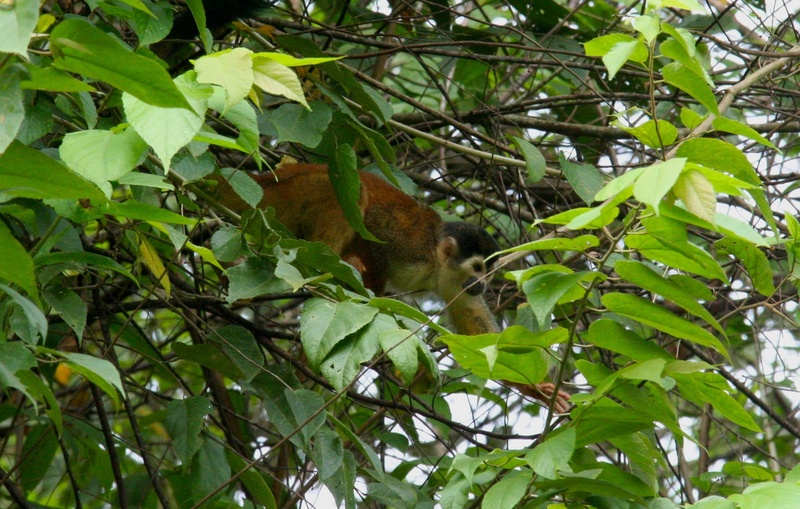 12:53 p.m. And this squirrel monkey came crazy close to us! 12:57 p.m. He was too cute!!! 1:03 p.m. 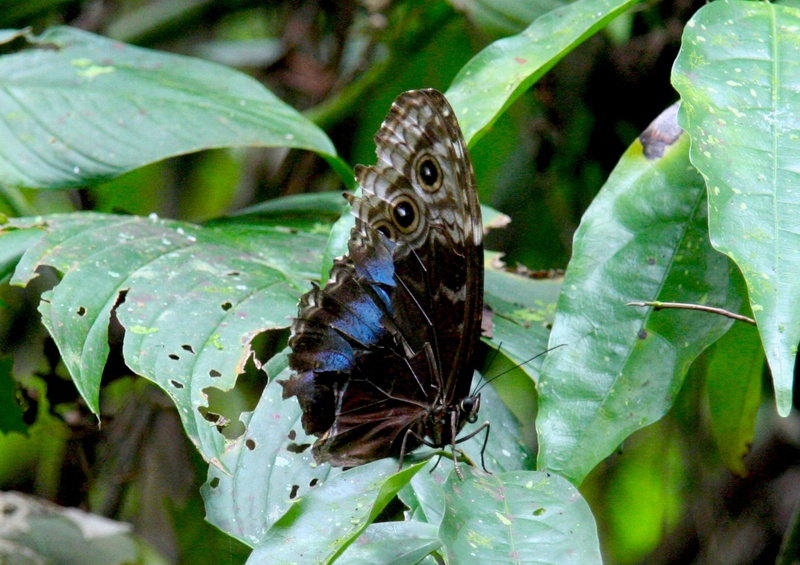 Though not the coveted blue morpho (which I saw fluttering around Pirate Cove! ), a blue butterfly nonetheless. 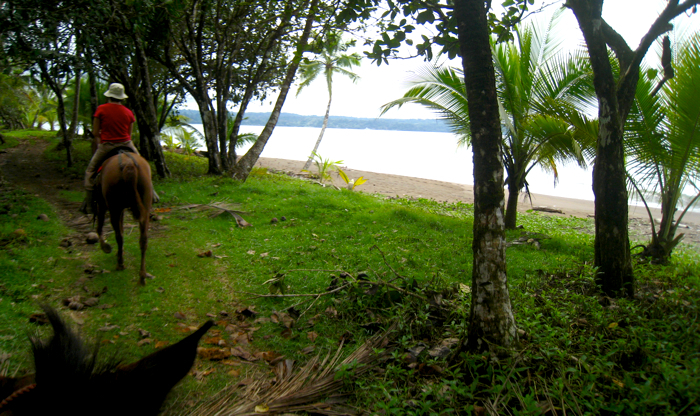 1:35 p.m. And that was my first trip to Corcovado, which ended with refreshing watermelon by the beach while we waited for our boat. I still think it’s funny how the guys get out to land and launch the boats! It took four guys (Javier’s there on the left) a few tries to use the waves to get us out to sea.